I’m always happy when my work inspires folks to take on their own creative endeavors. But in this case, the spirit of my song, “September”, just might have inspired a little too much confidence in three college boys out to make a concept video. I get the fact that the guy in front suspects something is going on yet somehow misses that there are two (bad) dancers prancing behind him, but as storytelling goes this sinks like a tugboat loaded with cement. I especially love that the dancers often duck prematurely, even before the guy in front turns around to discover nothing. And sometimes the music just mysteriously stops. Best is once the innocent in front leaves the room so that the guys don’t have to mime anymore, one of them continues to silently mouth the song. Once it turns into a full-blown dance off, I can’t say I would be awarding any prize other than to advise them that their allowance money ought to go towards a new mic. 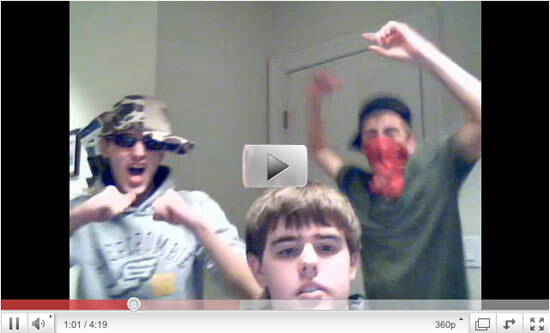 Without question, the best part of this video is the toilet paper covering the door of the room across the hall. 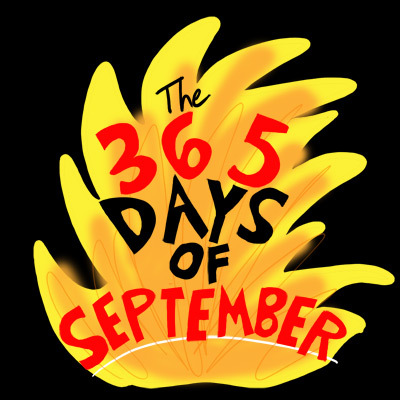 For a more through exploration of my “365 Days Of September” mission as well as details of how the song was written, go here. Until tomorrow, ba-de-ya! If for no other reason, this is fantastic for the player’s voice announcing what he’s about to perform at the top of this ’2groovy postparody ’ vid. 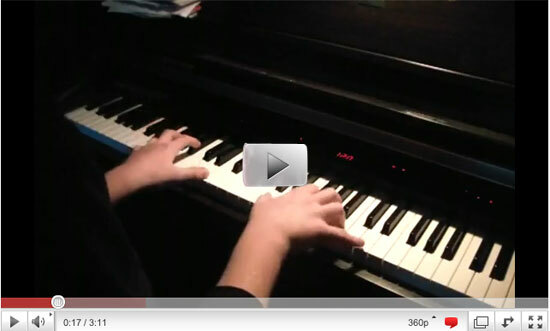 CharisC22 indeed plays a most spirited version of my first hit, “September”. I seriously love how tinny his keyboard sounds and how heavy he lays on the pedal as if Bigfoot is in the band. The brief narration noting the shift in mood at 2:11 slays me and the 60′s-Sondheim-kind-of-staccato-ishy-little-chord-juts-that-someone-like-me-who’s-sold-50,000,000-records-should-know-the-musical-term-for is outstanding as well. The kids at Fairview High do a noble job of singing and a much more ambitious job dancing than a lot of other high schools I’ve seen do “September” on Youtube. But, as the Grand Pooh Bah of Kitsch, the standout for me is the performance by the horn section. Either someone didn’t do their homework before they came to band practice or they’re just plain tone deaf. What it really sounds like to me is that the horn players got the big riffs down after the choruses and just figured they could coast through the single note accents. Which would have been fine had they managed to find the key. Far be it for me to not encourage someone to go farther in music because they’re un-schooled. I still don’t know how to read, notate or play a note of music, including “September” and anything else I’ve written, so I’m all in favor of doing it just for the love of it. I’m just sayin’, the horns are a standout, wayyyyy stand out. The Bakersfield High School Chorale is much more in tune and way more in the swing than most high school groups I’ve seen who attempt “September”. Whoever wrote the school chorale arrangement they all seem to sing felt the urge to throw in an abnormal amount of distinctively Caucasian “hey, hey, hey’s” as well as some very-suburban-no-soul-within-ear-range harmonies. Thankfully, the Bakersfield High School Chorale limit the “heys” to the intro and actually sound good despite the liberties taken with the harmonies and chords. 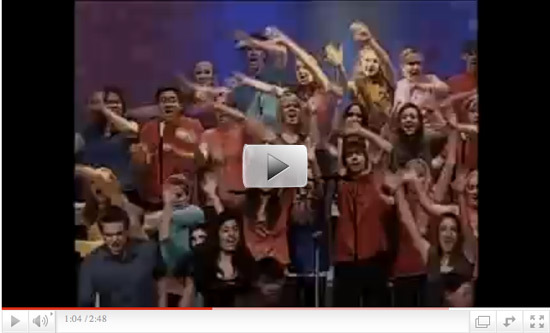 I also love how excited the audience gets over the “ba doo doo’s” at the end of each chorus. I do have one question about the lyric though. Having written it, I know that the third verse begins “Now December brought the love that we shared in September/ ONLY BLUE TALK AND LOVE, remember…” yet these kids sing ” was it Jew taught me love, remember” or maybe they’re saying ” was it you taught me love, remember”? Either way it’s wrong. So I wish that the person who was hired to write the arrangement all these high schools sing would think of themselves more as a transcriber than a co-author, especially if they get the gig on another one of my songs. 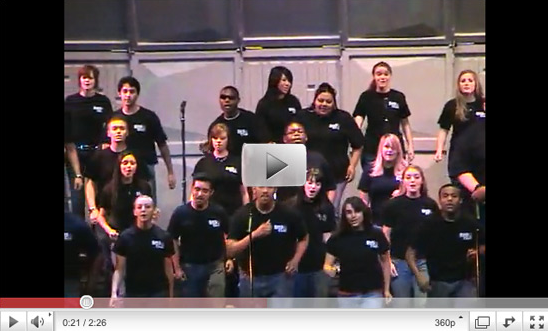 In the meantime, enjoy the best version of the corrupted arrangement I’ve seen so far – The Bakersfield High School Chorale. The Vertigo inducing ‘can I offer you some strobe?’ lighting and overuse of a smoke machine provide the perfect environment for “Margarita and the boys”, some of whom are clearly girls, to dance to “September” on this, Day 4 of the 365 day YouTube marathon. In searching for people “borrowing” my song “royalty free”, I can’t believe how many line dances there are to it. I always thought line dances were for country songs but now I know that line dances are for happy songs. 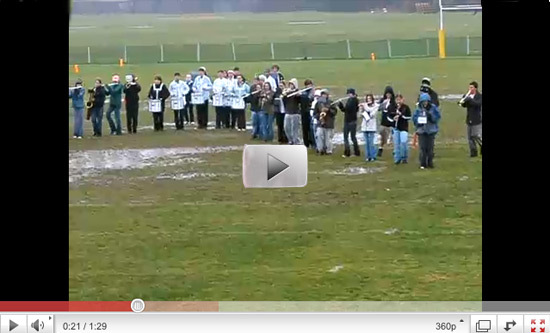 How happy am I that neither rain, sleet nor snow could keep the Kennett High School Marching Band from playing my song, “September” back in January of 2007?! I’ve been especially aggressive tracking down marching bands playing “September” as in a couple of weeks I have the great honor of conducting the University of Wisconsin marching band at the Homecoming halftime game when they play three of my hits, “September”, “In The Stone”, an Earth, Wind & Fire song that has grown to mythical proportions in marching band repertoires, and ” I’ll Be There for You (the theme from Friends)”, which I have no idea as to why it’s on the program when “Boogie Wonderland” or even “Neutron Dance” would seem more appropriate to drum the spirits up for the big game. Yesterday marked the first day of my year-long series featuring YouTube videos with people singing, playing, marching to, dancing to, massacring, auditioning with, acting idiotic in the presence of and otherwise performing my very first hit song, “September“. For a more through exploration of my “365 Days Of September” mission as well as details of how the song was written, go here. 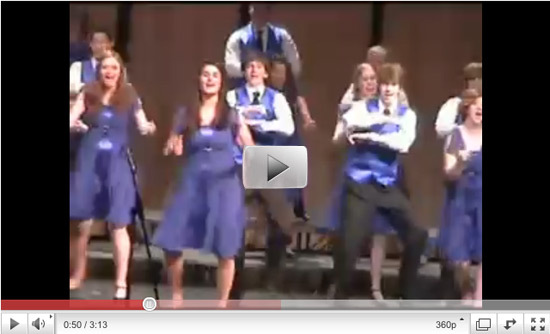 In the meantime, I hope you enjoy The Davis High Jazz Choir’s performance of the song, especially the choreography, as much as I do. Babeya! People always ask me what my favorite song I’ve written is. I hate to favor any of the babies but pound for pound I’d have to shout “September”! I think it’s an eternally uplifting song. It makes people HAPPY, not just with a capital H but ALL CAPS!! I write a lot of happy songs but even perennial foot tappers like “Neutron Dance” and “Boogie Wonderland” don’t inspire the immediate mood shift that “September” does. I’ve never been in a room where people’s toes didn’t start tapping or heads start bobbing as soon as it comes on. I’ve never been to a Bar Mitzvah or wedding where it wasn’t played, including Beyonce and Jay-Z’s, where I wasn’t but learned from US Weekly that that’s what they danced their first dance to. And they didn’t even get married in September. Allee Willis’ Kitsch O’ The Day – The 21st Of September Jubilee! 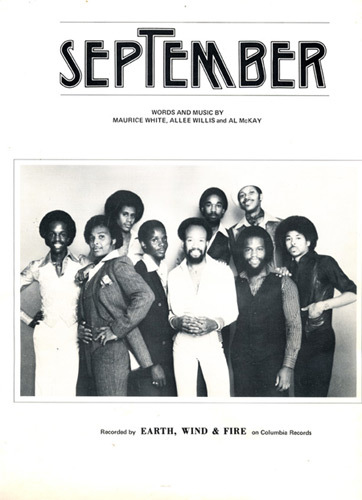 Because the opening line of my very first hit song, “September” by Earth, Wind & Fire, is “Do you remember the 21st night of September?” I constantly get asked the significance of that date, the very day it is TODAY. People are always looking for some great meaning, especially those whose birthdays are today and to whom the song has held a special place. Sad to say, the only real significance is that that it felt so perfect to sing. Those three syllables – twen-ty-first - hugged those notes tighter than an angora sweater and once that happens any good songwriter knows they need to just leave it alone because it works. What I’m most proud of achieving with my co-writers, Maurice White and Al McKay, is the transformative effect the song seems to have on people. I could be at a funeral and if “September” even came on as a ringtone most people’s lips would curl into a smile and their toes would automatically start to tap. Beyoncé and Jay-Z even chose it to dance their first song to at their wedding. And that makes me very happy.